This entry was posted on Wednesday, June 24th, 2009 at 4:51 am and is filed under Photography. You can follow any responses to this entry through the RSS 2.0 feed. You can leave a response, or trackback from your own site. 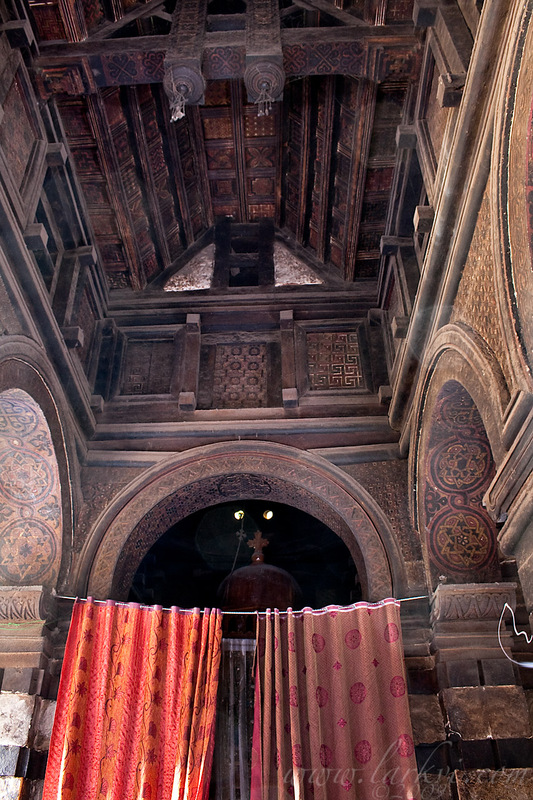 Yemrehana Kristos, in the village of Imrehana, 35km outside of Lalibela, is without doubt one of the most impressive churches in Ethiopia, and should be on the itinerary of anyone who is visiting the country. An hour’s drive from Lalibela over a 4WD road, it is slightly remote, and does not get the attention it deserves. 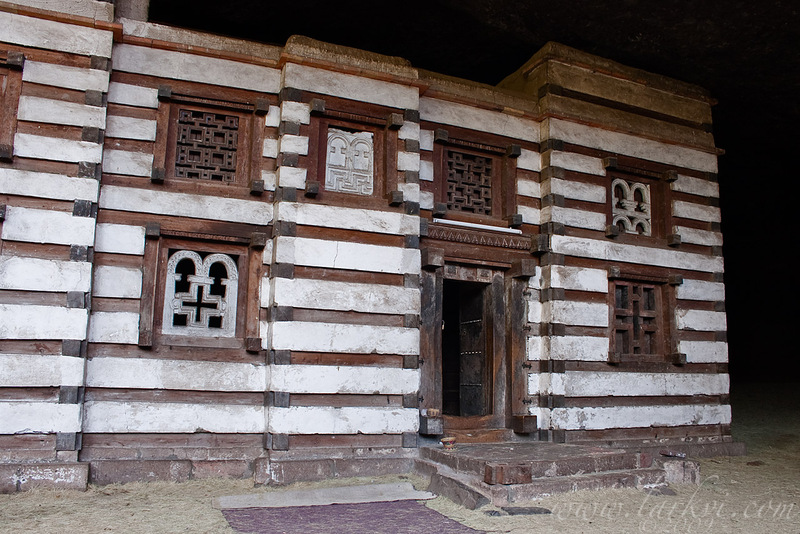 The church is one of the most important and impressive examples of the Axumite style of architecture. This style is characterized by the alternating layers and protruding beam-ends (‘monkey-heads’), as can be seen above. Another common feature, which can’t be seen here, is the presence of a number of blind (false) windows inside. Yemrehana Kristos is an interesting variant on the cave church, being a full, roofed church built inside of a large cave. Outsside of the church is the traditional former residence of the founding king and a bone-pile with the corpses and remains of an estimated 10,000 pilgrims (and possibly massacre victims as well). 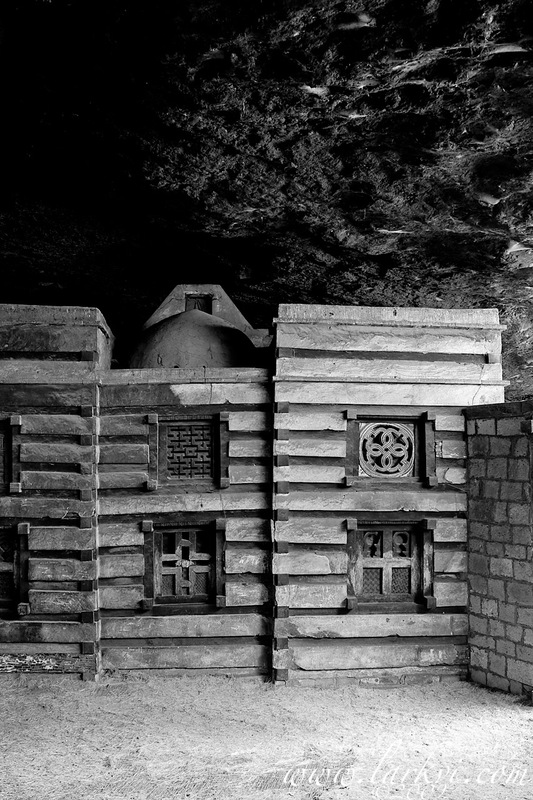 The somewhat unusual nature of this church as a full, roofed church built in a large cave is shown here. The wall on the right is recent, but this view, towards the sanctuary gives a good sense of the Axumite style of building. This interior shot, a mixture of natural light and light painting using flashlight over a two-minute exposure, begins to show how extravagantly decorated the interior of the church is, and also shows a characteristic Axumite series of blind windows on the upper level. The geometric decoration scheme is unusual in EOTC architecture, adding to what is exceptional about this church. The paintings are frescoes, and some are starting to degrade, making conservation a pressing priority. These tombs, I believe of King Imrehana and his brother (but I would have to look that up) are in the cave, next to the church. 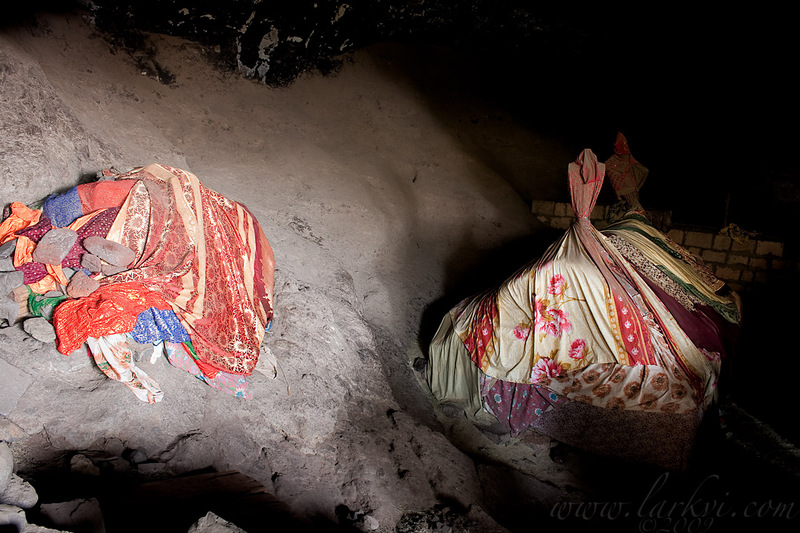 Ethiopians make a habit of covering anything of religious significance with large amounts of cloth, a custom well-exemplified here.